Summer is upon us! The weather is getting warmer. Daylight is sticking around far into the evening hours. Backpacks and lunch boxes are being put away. And summer camps are gearing up. If you’re like me, creating a plan for a fun filled, educational, physically active summer is important. Especially when it comes to planning the family summer vacation. This post may contain affiliate links. That means if you click a link and make a purchase I will receive a small commission at no additional cost to you. I only recommend products and service I have used and love. And I think you will, too. Summer means travel time in our family. With track meets, travel camps and conferences, we are always on the move. Our trips are often for several days at a time and we always have lots of luggage and the necessary sideline equipment. Whether we’re driving, flying or riding using the following tools has made our summer vacation planning stress-free. With so much going on over the summer, being able to see everything in one place is super helpful. This free downloadable printable from Cozi was just the thing I needed to see the entire summer in one glance. It allowed me to see how much time we had between trips, which trips overlapped with others and what days we have to just relax. Sign up for your free Cozi account and download the summer printable. I am a creature of habit. At each place we eat out I order the same dish. My morning routine is exactly the same no matter the day. The same goes for my travel. I like to stay at the same hotels, fly the same airline and fill my tank at the same fuel station. So I keep all my travel details combined with the TripIt App. The TripIt App keep allows you to keep every aspect of your trip in one place. Hotel, flight and excursion reservations made with the same email address are all grouped by location and date for a complete view of your entire trip. Use it online at www.TripIt.com or download the mobile app from your device. With everything else we have to prepare for our summer trips, packing everyone’s clothes became a bit of a chore. 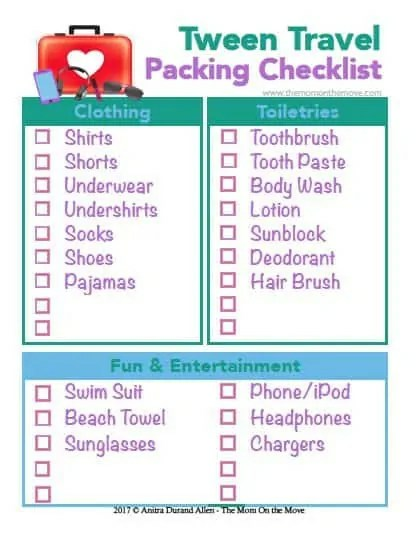 To lessen my stress, I created these packing checklist printables for my kiddos. 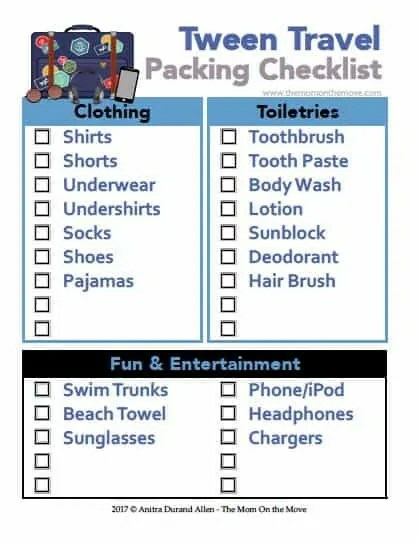 These checklists serve two major purposes: give my children a sense of control and say so in their vacation planning and crossing items off my own checklist. 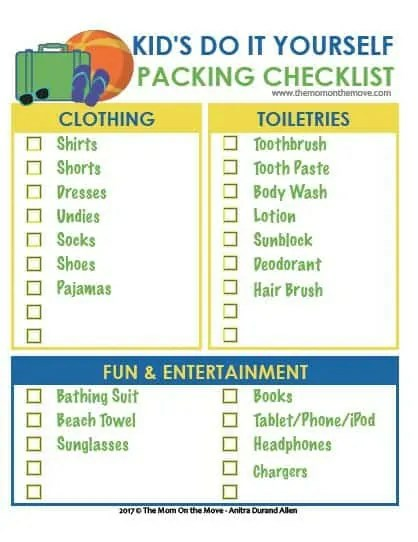 Download your kids or tweens packing checklist by clicking on the image below. Have you ever arrived at your destination only to find your suitcase has been tossed by TSA? What a joy. On my last trip home I realized just how effective and useful packing cubes can be. Keep everyone’s items easily identifiable with different colors and sizes. In addition to keeping your luggage organized and neat, you can also use cubes to separate clean clothes from dirty ones at the end of a trip. Get your full set of packing cubes from Amazon here. At the end of a hot, sweaty weekend at the track, the last thing I want to do is pack up all our stinky clothes in a suitcase to marinate for several hours. To avoid the funk potential of that scenario, I use Odor Removing Packs and Odor Removing Spray from Fresh Wave. Their products contain all natural ingredients for odor removal. So if you’ve got allergy concerns like we do, or you’re just chemical conscious and crunchy, this product is one for you to consider. It’s got a minty eucalyptus smell that kept everything in our bag fresh. How do you prep for your summer vacation? What tips can you share to keep it stress-free? Drop a comment below and let us know.